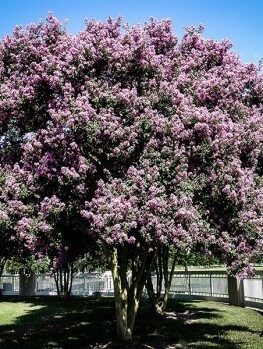 The Hopi Crape Myrtle is a medium-sized deciduous shrub that will grow 7 or 8 feet tall, and about 10 feet across. From summer to fall it is smothered in a continuous display of bright-pink flowers, in large clusters, that will brighten your garden month after month. In fall the leaves turn vibrant shades of red, orange and gold, and the mottled winter bark is attractive too. This easy-care shrub will grow in hot, sunny places, and it is very drought-resistant once established. Grow it as a lawn specimen, as an informal hedge or screen, or in a sunny border among other shrubs. Whatever way you use it in your garden, you will love the continuous colorful blooming, with so little care needed for such a big return. 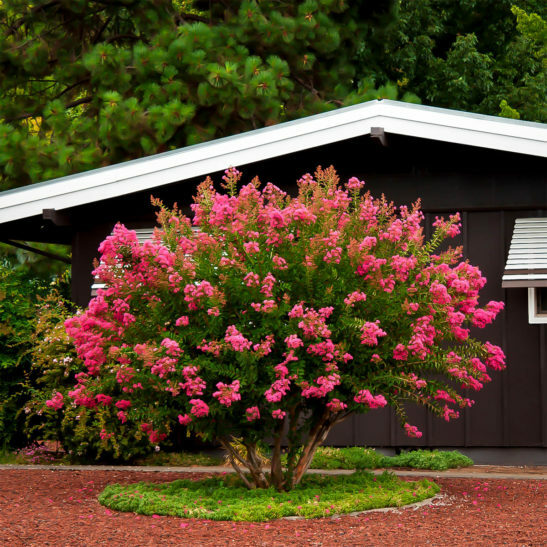 Plant the Hopi Crape Myrtle in a sunny spot. It will grow in light shade too, but flowering will be reduced. It grows easily and quickly in almost any well-drained soil, including poor, urban soils. It has been especially bred to resist disfiguring powdery mildew, and unlike older varieties that only grew in zone 7 or warmer, this plant grows well in zone 6, and it will even grow in sheltered spots in zone 5, although there it will not grow so tall. Shrubs like this, which deliver so much color for so little care, should be the backbone of any garden, so choose beauty and easy-care, and plant this shrub today. 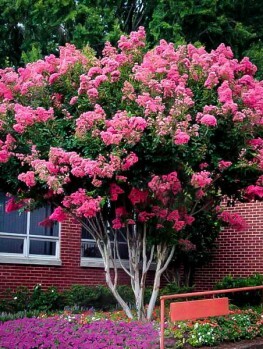 Drought-resistance and tolerance of hot, sunny places; more than 4 months of continuous bright-pink blooms; a medium sized shrub that will fit in all but the smallest of gardens; easy-care, plus pest and disease resistant – what’s not to like about the Hopi Crape Myrtle? 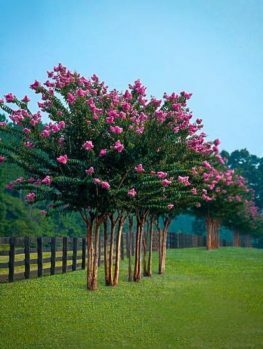 Crape myrtles are tough shrubs with an established reputation for easy care and consistent flowering, which as made them the backbone of many gardens in warmer areas. 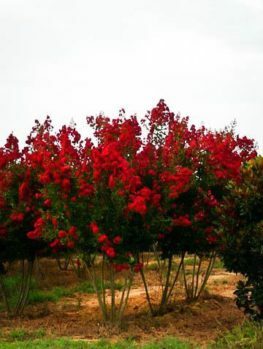 The Hopi Crape Myrtle is among the pick of the bunch, having been bred to resist the mildew disease that disfigures most traditional varieties. Not only that, it is more resistant to cold than almost any other variety, so for this shrub zone 6 is a breeze, and even in zone 5 it will survive with a little care, and quickly recover from winter damage. 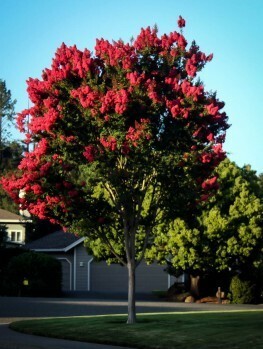 The Hopi Crape Myrtle is a medium-sized deciduous shrub, reaching 7 to 8 feet tall in most situations, and spreading to about 10 feet wide. It is fast-growing, so you will soon have a substantial plant bringing flowers to your garden all summer and fall. The large flower heads are 6 to 7 inches long, and they are packed with unique ‘crape-paper’ textured bright pink flowers. It begins to bloom in mid-summer, and continue right through into fall, ending only with the onset of cold weather. To top it all off, once fall comes the leaves will turn strong shades of gold, red and orange, joining your other trees in celebrating the season. In spring, even before the first blooms arrive, the rich glossy green foliage is attractive, and the mottled winter bark is handsome too. This vibrant multi-season display will brighten your garden – and with almost no care from you. 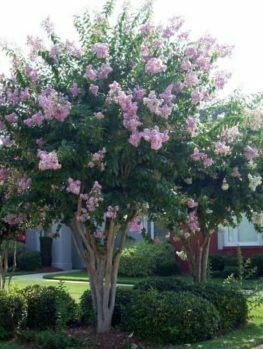 You can grow the Hopi Crape Myrtle as a rounded, multi-stem shrub, or you can easily train it to a single trunk, and so grow it as a small tree. Either way it will be constantly smothered in blooms, and this plant makes a colorful addition to any garden. You can grow it as a specimen on a lawn, in a row as an informal screen or hedge, among other shrubs in a border – wherever you use it you will love it. 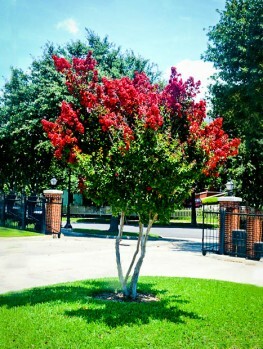 Plant the Hopi Crape Myrtle in full sun, as shade reduces flowering. Once established it will be happy in even the sunniest and driest spot in your garden – these plants are renowned for their drought-resistance. It will grow in almost any kind of soil, just so long as it is well-drained and not constantly wet. Even in poor, rocky soil, this plant will thrive. To produce the maximum blooming, remove spent flower heads as they fade, cutting back to the first pair of full-sized leaves. New shoots will quickly develop, bringing more and more blooms. In fall, if you stop removing the spent flower heads, they will develop into attractive seed pods that persist into winter, adding interest to that quiet time of year, and drawing attention to the mottled bark of this shrub in winter. The only other care your Hopi Crape Myrtle needs is an annual pruning in early spring. If you live in a colder area it will be easier to prune if you wait until the buds begin to sprout – then you can see what parts need removing. Remove any dead branches, and then cut back the old flowering stems. Cut weak branches back by two-thirds, and strong branches back by one-third. Always cut just above a pair of buds. On older shrubs you can also remove a few of the oldest branches completely, to keep a more open structure. 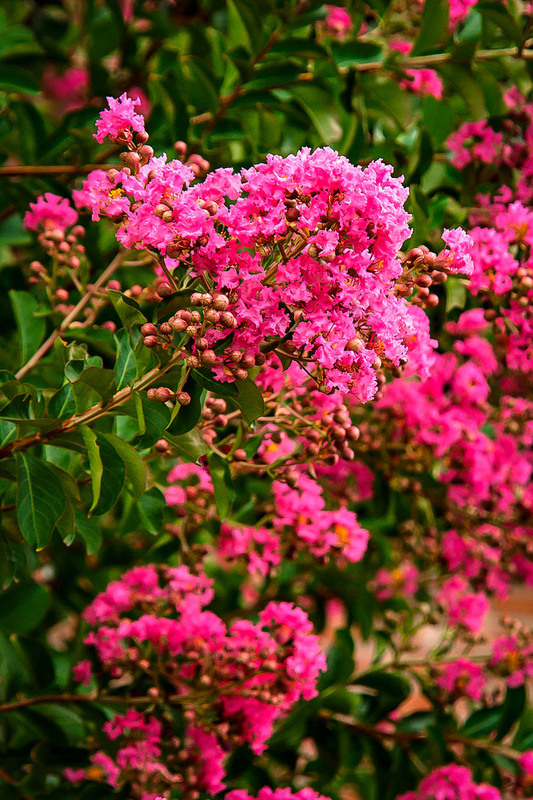 The original Crape Myrtle, Lagerstroemia indica, is a small tree that grows wild in China, India and Japan. It was introduced into the US in Norfolk, Virginia at least 150 years ago, and became an instant favorite in the warmer states. Unfortunately, this tree is regularly disfigured in summer and fall by powdery mildew, which covers the foliage in a white powder. 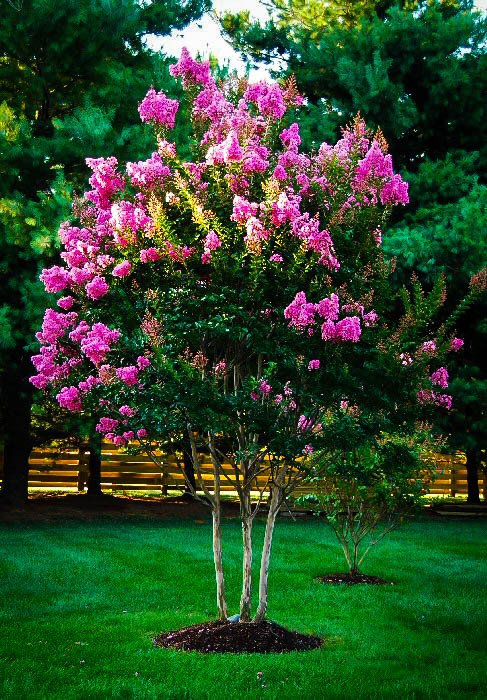 The Hopi Crape Myrtle is one of a group of Crape Myrtles developed in the 1960s at the National Arboretum, Washington, D.C., with the goal of overcoming this problem. The plant breeders there took other species of Crape Myrtle, especially the Japanese Crape Myrtle (Lagerstroemia fauriei) and produced many hybrid seedlings. From among hundreds of young plants they selected a group of the best, which were more resistant to cold and to powdery mildew, and that had particularly colorful and bold flowers. 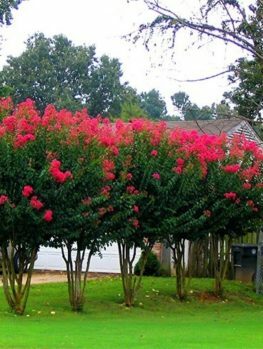 All these Crape Myrtle varieties were named after Native American tribal groups, and Hopi is widely considered to be one of the best. Our plants are propagated by rooting stem pieces taken from correctly-identified examples of this plant, with its well-established track-record for reliability. They cannot be compared with cheaper seedling trees, or common un-named varieties, which will always be inferior and more prone to disease than selected, named plants. Crape myrtles are among the most popular shrubs we sell, so these healthy young plants will not be with us for long. Order now while our stocks last.